Since the Black Meddle duo of 2008-2010 relaunched Nachtmystium as a progressive, drug-fuelled black and roll machine, taking as much from 70s prog as 90s black metal, it's been customary to see them as some kind of mainstream-botherers, up there with Satyricon in terms of distance travelled from the underground. I've never held quite so poor a view of them, although I was fairly unimpressed with Addicts after quite enjoying Assassins, it seeming to lack the songwriting nous and clarity of vision that the earlier album had. (I quite enjoyed the most controversial song from there, ironically, No Funeral's backing keyboard melody and clunking percussion tickling my catchy bone.) Silencing Machine, the band's sixth full-length, is not explicitly a continuation of the Black Meddle duo, although it does move the band's sound onwards from that, taking a small step back towards black metal without at all relinquishing its bony grasp on the psychedelic elements. A step sideways rather than a reinvention, then, but containing more than enough black metal anthems to make it worthy of fans' time. ...But again, don't mistake this for anything other than a black metal creature, when all is said and done. There's a grim, humourless scowl with even the catchiest of moments present, with none of the nods and winks of previous albums - yes, the intro to And I Control You may have a strangely Mastodon-ic vibe before the main, droning riffs start to ring out, doom-laden atmosphere with interjected saxophone, widdly soloing and ominous melodic rambles slotted in well. My colleague Charles pointed out in his review of Addicts that it's almost like the band want to remind you that they are USBM, and even whilst you absorb the very well-constructed experiments, even as you note that each track has its hook, it's hard to forget that Nachtmystium are an underground band above all. The eight-minute Lepers Of Destitution sounds somewhat Ukrainian with its grasp of melody in the guitars, even as the technical and varied drumming reminds you that they're not. Borrowed Hopes And Broken Dreams is probably the catchiest track present, a riff-oriented melancholic groover with space rock synths that's at once danceable and utterly miserable, although Give Me The Grave is close behind in terms of infectiousness. I Wait In Hell inverts this a little by being hook-y during the verses, then launching into spit-flecked rage during the chorus, complete with full-on blastbeats as Judd howls madly, although I'm less fond of the usage of samples. It's only fair that the following Decimation Annihilation slows to a mid-paced crawl, psychedelic black n'roll like recent Darkthrone and Voivod in a strangely fitting mash-up. 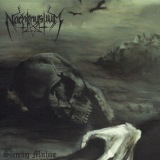 And although Reduced To Ashes returns to blastbeats, it's hard to recommend Nachtmystium if you want a pure black metal release, the album leaning more towards the slower soundscapes of Those Rooms In Which We Weep. It's all still highly effective in atmospheric terms, however, and although not similar to the likes of Demise in sound, it's still clearly the same band - as fascinating as ever, with a new maturity that suits them well.